So I’ve been a little lax with my updates over the past few months. My excuse is that we’ve all been far to busy working on the movie to spare any time to write about it. Our trip to LA bore fruit in the generous and unexpectedly lengthy article run by 3d Artist. 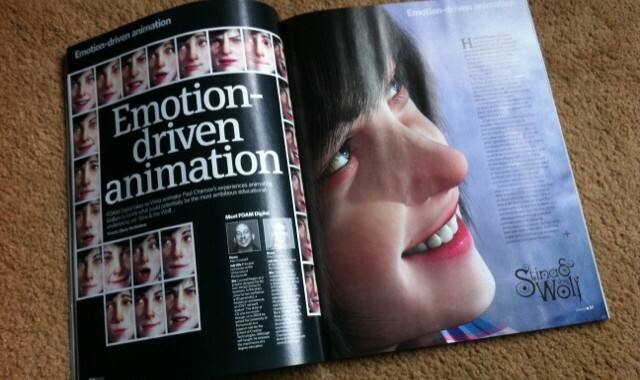 Along with the accompanying 3d tutorial it stretched to a whopping 12 pages! Thanks to Lynette at 3D Artist for championing our cause on this. With our double page images (thanks go Solid Angle here for lending us some Arnold licenses for the super high detail renders) it was a great platform for talking about the film and Foam Digital. Myself, Alex and the students were given a lot of scope to frame the story however we wanted, with Alex and i writing over 10,000 words that were eventually edited into a very comprehensive piece. Other really big news is that we’ve secured new funding internally through the university HIEF fund. This will take the pressure off me and Alex a little, as it will allow us to buy some of our time out to focus more on the production. (Although I expect the odd all-nighters may still be on the cards here and there) We can now also afford a lot of the specialist software and machines we need for some of more challenging technical areas of the production. (Mostly related to fluid, cloth and particle simulation and rendering) We will also be able to bolster our back end systems with server hardware and software that will help us establish a solid and reliable pipeline, essential as we progress into full production. The plan for the new year is to complete our ambitious cinematic trailer. It has a lot of variety and high end production value shots, so will take all the time and money we can throw at it to get to the quality levels we’re after. Our latest trailer edit showcases some exciting key scenes from the film and will hopefully offer a good slice of our narrative, thematic and stylistic approaches. It should also act as a launch pad for us to seek full film production funding towards the end of the year. We now have over a hundred staff in Foam Digital and our pipeline is slowly but surely starting to function like a real VFX film pipeline. We still have a fair amount of work to do on developing our assets publishing and control system: Tank, as we push it to deal with the realities and complexities of our full CG feature pipeline. We will be seeking help with this from some top Soho VFX houses over the coming months. We now have the scheduling software Shotgun functioning well with our integrated online artist review software Revolver (thanks for the fantastic support from Shotgun and Tweak software on this). We are already pushing shots through Mo-edit and Previz and off to the other departments, where animation, environments, vfx and compositing have started work. We have also started development on the sound design and folly for the trailer and have a professional sound designer and audio wiz Ian Palmer on board to help our talented homegrown (and now ex-Lionhead studios!) lead sound designer Chris Popiel. That’s all for 2012. If we can pull off our very ambitious shot list, we should have something pretty special to show you all in June 2013.